I am now entering my seventh month of protective styling and I have noticed the length of my braids has increased slightly. As I was setting my hair for the night, I stretched my hair to get a better idea of my growth progress and I noticed my hair came a little further down my side from where it was when I started my protective style challenge. Slowly, but surely I am progressing toward my goal of waist length. I just have to be patient and continue my regimen, carefully preserving my ends. I fell off with my weekly wash routine the past three weeks, because of my crazy holiday work schedule, and accumulated a lot of buildup. Reason being, since I didn’t have time for a real wash, I had to keep my hair moisturized by at least soaking it in water, applying SN conditioner, then letting it air dry. Not exactly co-washing, but simply rehydrating. As usual, by the third week, my scalp was super itchy, I had copious dandruff, and there was visible sticky buildup at my edges where I reapplied gel when I scratched. Gross. My hair looked great on the surface, but it was super dirty under closer inspection. My hair and scalp were in desperate need of a deep cleanse. The first two consecutive days off I had since the holidays started, I tried to wash with glycerine soap, but the soap just wasn’t hitting it. It was breaking up some of the buildup, but there was just so much of it that it was taking a longer time to clean so I had to break out the big guns and grab a sulfate shampoo. Yes, it was that bad. Only sulfates were going to cut through the mess of sebum, dandruff, gel, oil, conditioner, and shea butter that was gunked up on my scalp. For the first time in a long while I really missed my bentonite-rhassoul clay mixture, but since I never re-ordered any, the sulfates were all I had. The amount of buildup was unbearable and I couldn’t take it anymore so I was grateful to finally be able to dedicate the proper amount of time and care to washing it and if sulfates got the job done, so be it. I ended up using a Garnier Fructis shampoo. I didn’t even look at what kind (I grabbed the only shampoo I saw in the bathroom) until mid-wash when I started thinking about what kind of protein treatments I had handy, at which point I quickly realized I had none. All I was focused on was thoroughly clarifying my scalp and hair. Turns out, the formula I used was specifically design to strengthen strands and prevent thinning and breakage as it contained biotin, caffeine, and fruit vitamins. I didn’t need to do a protein treatment after all. Most fortunate, no? If you’re really curious about the exact formula, it’s Garnier Fructis Fall Fight. Old School OG Products Make a Comeback? I’ve noticed a growing trend in women hopping off the bandwagons and doing their own research, questioning information fed to them rather than accepting it without a second thought, to explore whatever products work for their hair, regardless of ingredient taboos. Among those ingredients, silicones, petroleum, lanolin, and mineral oil. Yup. If you’ve been reading the blog for a while, you know that I vacillated between the CG Method and mixing my own products, ingredient-conscious all the way, but recently let go of restrictive views on ingredients and allowed for mild silicones in my hair care routine. Well today, while perusing the NHC, I was made aware that many naturalistas are still using good ol’ hair grease or are returning to grease as a cheap sealant. My first instinct was to nay the lot of them, but when I think about it, my hair was pretty damn long (tailbone length) as a kid and all my mother ever used were products found on the “ethnic” hair care aisle; jars of pink jelly-like substances, Blue Magic, Softee, Bronner Bros, etc and it wasn’t uncommon for body lotion to be used as a moisturizer either (think Shea Cocoa Butter and Lubriderm). She even hot combed my hair with hair grease and it always reverted to my S-curls and coils. These all sound crazy now, but they served their purpose along with pigtails as a constant protective style. Description: A light, non-greasy hair treatment enriched with Lanolin, natural Indian hemp, and a blend of natural herbal and essential oils along with vitamin E to help ensure maximum hair growth. A blend of the finest ingredients for the conditioning treatment of dry, damaged, or processed hair. Provides body and gloss to brittle, dry hair for natural softness and manageability. Why I bought it: I saw just as many women say they use this particular product as I did women who said they use Blue Magic. 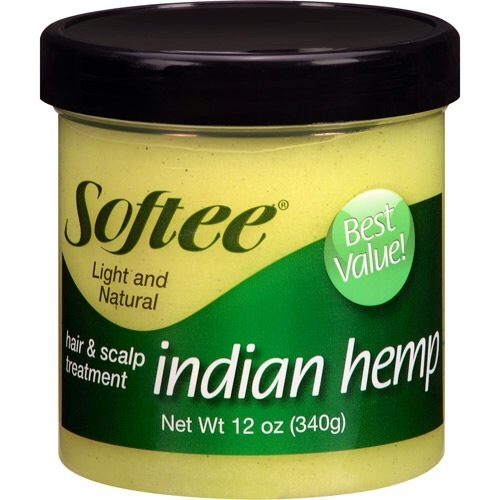 I also recall using Softee hair grease when I was relaxed and how well it kept my hair moisturized. Too moisturized, in fact. I was still learning to do my own hair and I always ended up using waaay too much. Description: Formulated to enhance and nourish your hair and scalp. Contains pure coconut oil and jojoba oil to make hair soft and glossy while protecting your style and keeping hair moist and healthy. Helps prevent dryness, breakage, and split ends. Helps protect your hair from daily trials and tribulations (fnas, the sun, etc). Helps control soft , new hair growth. Helps keep scalp lubricated and free from unsightly flaking. Why I bought it: The second ingredient is coconut oil. Despite the petroleum base, coconut oil’s position in the list of ingredients makes it an extremely cheap alternative to the $7-10 jars of pure coconut oil I usually buy. I also couldn’t decide between this and the Indian Hemp so I bought both. Description: Enjoy the refreshing scent of a tropical waterfall as gentle cleansers bring out the natural beauty of your hair. 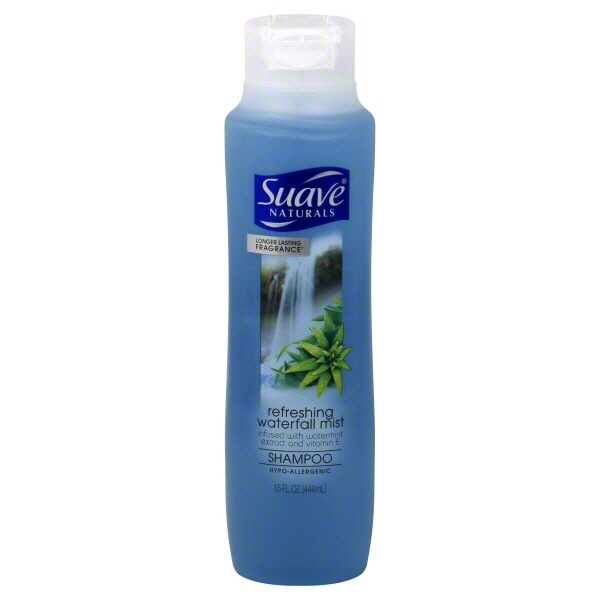 Why I bought it: Suave Naturals is my staple rinse-out conditioner and the crucial ingredient in my leave-in spritz so giving the shampoo a shot didn’t seem farfetched. Plus, I need a sulfate shampoo to thoroughly cleanse my hair and scalp of the petroleum and mineral oil. Description: Revitalizes dry, thirsty hair & skin… For hair, bath, and body. Ingredients: Soybean oil, parfum, castor seed oil, t-Butyl Hydroquinone, olive fruit oil, sweet almond oil, jojoba seed oil, walnut seed oil, sesame seed oil, carrot seed oil, safflower seed oil, kiwi fruit extract, cucumber fruit extract, matricaria extract, calendula officinalis flower extract, Achilea millefolium extract, sage leaf extract, and carrageenan extract. Why I bought it: It contains just about all of the natural oils naturals love, from jojoba to olive, to castor to soybean, to sweet almond to Safflower, all listed in the ingredients from the very top of the list. I chose this over my old friend Hot Six Oil because it has more actual oils without the extra silicones thrown in between. Who needs silicones in an oil blend? That’s just redundant. 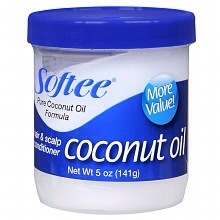 I decided to use it in my leave-in spritz in place of coconut oil, soybean oil, and castor oil. In a nutshell, I chose all of these products because they are superhero cheap and I have had positive experiences with these brands when I was natural as a child, later on when I relaxed, and on into the beginning of my natural hair journey. On top of that, the smell of the products took me back to when I was a little girl sitting in the kitchen while my mother hot combed my long hair for special occasions and when my father combed my hair before school. To an extent, it boils down to brand loyalty, sentiment, and also the quality of ingredients, compared to similar products, as these contain many of the oils we use everyday. If you’ve followed me for a while now (from YouTube to blogging), you know I’ve used the spectrum of hair products, good and “bad.” I’ve tried Carol’s Daughter, Bronner Bros, Miss Jessie’s (remember when everyone was up in arms when they found out Miss Jessie’s products had all those “bad” ingredients in them? Years later, people still love them), As I Am, Shea Moisture, Qhemet Biologics, Terressentials, castille soaps, glycerin soaps, sulfate shampoos, non-sulfate shampoos, V05, Suave Naturals, Oyin Handmade, mango butter, shea butter, jojoba oil, castor oil, extra virgin olive oil, soybean oil, sesame oil, tea rinses, baking soda rinses, flaxseed gel, Eco Styler, Jam, pure glycerin, Alba Botanicals, Beyond the Zone, Aussie Moist… Look, you name it, I’ve tried, regardless of ingredients, but I’ve said before that my hair grew the most and retained the most moisture back when I first went natural and all I was using then were products containing sulfates, mineral oil, petroleum, lanolin, and silicones. -shrug- It is what it is. I never had any issues with them and I only stopped because the natural hair community, true to its nature, jumped on the bandwagon of naysaying certain ingredients and practices without much thought or research and told me to stop. Truth. Many of us don’t research what we’re told and just accept information presented as fact if it sounds good enough to be true. The truth of the matter is misinformation is pushed our way all the time. There is nothing wrong with any of those “taboo” ingredients, especially when used properly. There are no serious health risks associated with cosmetic and medical grade mineral oil or petroleum that have been proven. Those myths are based on their chemical composition without regard to chemical changes that occur when combined with other ingredients or refinement as well as their industrial use as opposed to their cosmetic and medical uses. Sodium Chloride (table salt) is harmless, but separate the it into its respective elements and they are. Mind you, castor oil is used in the process of creating of brake fluid, but we love to slather it on our ends and edges. Perspective. Always do your own research and question with an open mind before simply accepting what is presented to you as fact. I don’t intend to be as heavy-handed with the grease as I am with my shea butter mixture, especially since petroleum and mineral oil are much more potent when it comes to sealing in moisture; a little really does go a long way. The purchase of the sulfate shampoo was necessary in order for me to break up the grease in my hair and avoid buildup, just like the glycerin soap was necessary to remove the mild silicones from my deep conditioner. My cleanser must be proportionate to my products. Hopefully, I have convinced some of you to dig deeper for more information (beyond the internet) and try out a few products you previously turned your nose up to or loved until you were told they were oh-so-terrible (remember the look you had on your face when I said I washed my hair with soap, but then you saw the results? lol).